Tecta America Specialty Contracts Division was proud to attend and support the Tecta America Colorado office by exhibiting at the 9th annual Advance Colorado Procurement Expo on April 3rd, 2018 in Denver. 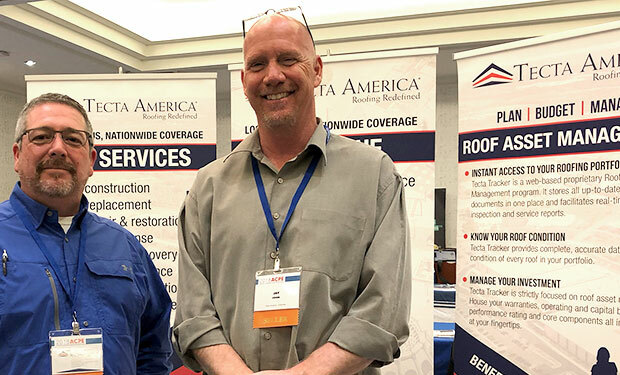 In attendance for Tecta America Colorado was Jay Cook Estimating Manager for the Denver office and Andy Carr with the Specialty Contracts Division. The goal of attending this expo was to meet and network with small and minority business across the state of Colorado and support them with possible opportunities to work with Tecta on future projects. The Advance Colorado Procurement Expo, now in its ninth year, is Colorado’s premier buyers and seller’s marketplace! Every year, businesses are invited to participate in this day-long event, which focuses on state and local government procurement. Small businesses (sellers) exhibit throughout the day to showcase their goods and services to local and state government agencies (buyers). Exhibitors are able to meet with procurement professionals from those agencies to learn how to best sell their goods and services to them. All businesses, including those owned by women, minorities, and veterans participated. In addition to the expo hall, training sessions were held in the afternoon on the topics of government procurement. There was also a keynote speaker during lunch, as well as engaging one-on-one sessions between buyers and sellers.